It's Beth Israel Deaconess Medical Center and Lahey Health's word against the Massachusetts Health Policy Commission's. Rebutting a highly critical report from the commission, Beth Israel and Lahey last week argued that their combination is necessary to heal a dysfunctional Massachusetts healthcare market. It's the only way to check Partners HealthCare, the most powerful provider in the market. Executives said they will help expand the state's now-limited behavioral health service network, helping divert patients from costly emergency departments. They pledged to use their combined purchasing power and expertise to lower costs, which they say will outpace any potential price increases. That's in stark contrast to the commission's findings, published in July. The independent group tasked with keeping healthcare costs, access and quality in check contended that the costs outweigh the benefits, and that nothing will prevent them from raising prices, other than the state's annual 3.1% cost growth ceiling. The bargaining leverage they would gain from more market share would dwarf price concessions from purported efficiencies and more direct competition with Partners, commissioners and economists argued. “The efficiencies to be gained through enhanced coordination of care, scale, purchasing power and savings, among others, will not be passed along to the consumer on a dollar-for-dollar basis, and these efficiencies are not even in the ballpark of the guaranteed price increases,” said Ken Marlow, chair of the healthcare department at law firm Waller Lansden Dortch & Davis. The deal involves Beth Israel in Boston and Lahey in Burlington, as well as Boston's New England Baptist Hospital, Mount Auburn Hospital in Cambridge and Anna Jaques Hospital in Newburyport. The combined entity would have an acute-care network of 10 hospitals, compared with Partners' eight. It would also have three affiliate hospitals, the Cambridge Health Alliance, Lawrence General Hospital and MetroWest Medical Center, and more than 4,200 physicians. According to 2016 financials, the proposed Beth Israel Lahey Health had combined net patient revenue of $4.79 billion, compared with Partners' $7.57 billion. However, Beth Israel Lahey would have more than double the net patient service revenue of the next largest provider system in UMass Memorial Health Care. Beth Israel Lahey executives argued that maintaining the status quo would hurt state residents, since the parties involved reported a combined operating loss of $70.8 million a year in fiscal 2017 and would likely have to pare down services. “If I were a system losing money, I might use the efficiencies to improve the bottom line before I would change prices,” said Joe Lupica, chairman of Newpoint Healthcare Advisors. The merger does pose some clear benefits in accessing capital, Lupica said. If the combined entity earns a better bond rating, it could access capital more cheaply and theoretically reduce prices. Moody's Investors Service downgraded the credit rating for the parent organization of Beth Israel Deaconess, CareGroup, to a negative outlook in March, as financial performance at Mount Auburn Hospital faltered and Beth Israel increased its debt load related to its $534 million expansion. A potential merger with Lahey could change that outlook, the agency said. The commission warned that Beth Israel Lahey would have greater bargaining leverage with commercial payers and potentially allow it to boost prices by 5% to 10%, increasing spending by up to $251 million a year. The healthcare systems poked holes in the commission's economic projection model. When Lahey acquired Winchester Hospital in 2014, the commission used the same “willingness-to-pay” model to predict a 4% to 5% increase in prices. But prices did not materially change, executives said. Beth Israel Lahey estimated that redirecting care from higher-priced providers would net $9 million to $14 million in savings, integration would net $52 million to $87 million, cost synergies would save $42 million to $66 million, and other savings would yield $46 million to $103 million. 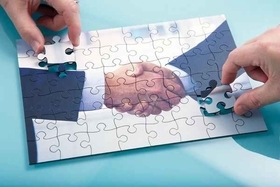 Besides keeping Partners in check, the merged entity would streamline its ambulatory-care network, standardize purchasing, reduce outsourcing of certain commercial reference laboratory services, and centralize claims and clinical data for population health analytics, executives contend. The Massachusetts Association of Health Plans and the Massachusetts attorney general agreed with the commission's findings.